Unless you've been living under a rock (or you're my friend Kristen who doesn't care about football or keep up with current events) you know that college football started Saturday. Well actually it started Thursday night but for me it started when my team took the field. It actually wasn't Barrett's first game because of a little post season game we played in last year called the National Championship. 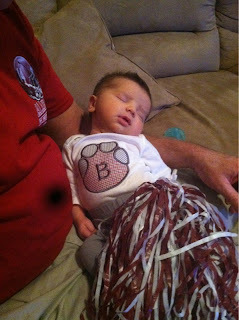 Sweet little Barrett was only 2 weeks old when he first cheered on the Tide. Here we are 8 months later with sweet Ally Bama. We went to a friends house to watch the game. (Same place we watch the National Championships). I'll be honest I didn't watch much of the game but I watched enough to know that we need some work. It's crazy how the times change. 7 years ago I wouldn't have had one complaint about a 35-10 win. With his Granddaddy in their Bama gear. 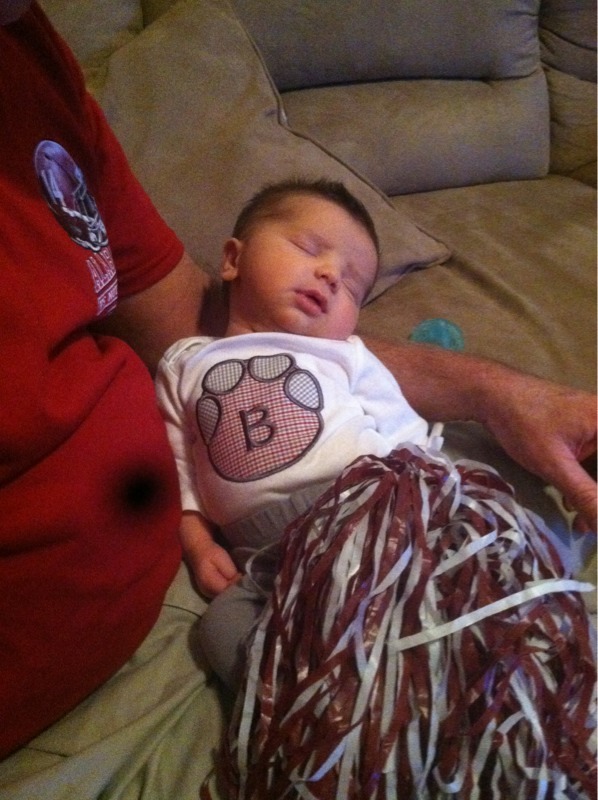 When we got home Barrett watched a few downs of Auburn with Daddy. It was a fun day but I felt a little "off" all day. I can't really put my finger on it. I was texting with my little brother and sister that morning, they were both in Atlanta and going to the game. I was so excited for them but I felt a little left out. I watched most of Gameday on ESPN between taking care of Barrett and my weekend chores. Normally, I'm watching as many games as I can. Saturday I turned on Texas A&M but I ended up taking a nap. Things picked up when I got Barrett up from his nap and put him in his cute Bama romper. I enjoyed getting to hang out with our "tailgate family". I missed Patrick, he had to work and then he stayed home to watch Auburn. I was trying to explain to him how I'd felt all day and he kinda summed it up as now football seems so small now. We both still love it, we love our teams but a baby changes everything. And then he promptly jumped up to scream and celebrate with the amount of team spirit that would make any cheerleader jealous. I guess there are some things that even a baby can't change.